For a brief and glorious time each year cherries are available, and I eat them all. Bing, rainier, and sour--each has their place. Rainer are crisp and delicate, with a hint of cream in the flavor. Their pale color turns out to be a real advantage if, say, you are sharing them with a toddler. I learned that lesson the hard way. But bing and sour are the champions of east coast cherries. 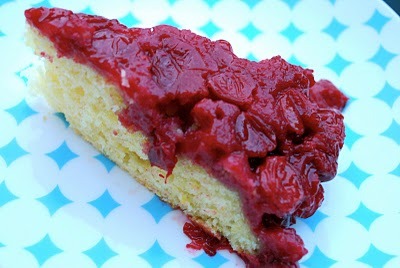 I usually reserve bing cherries for eating fresh, or lightly cooked, and bake with the sour cherries. I had planned on making a pie, since cherry pies are my absolute favorite pie. I remember my Grandmother making tens of pies for church functions. The only thing more amazing than one cherry pie is 50. But, the cherries there came from a can, as so many do. I say, buy a pitter and get on with your life. As I said, I had wanted to make a pie, but things were hectic and the kitchen was in no state to accept the amount of dishes generated by pie making. And then I found this cake with cornmeal. I guess the cornmeal and cherry itch had not yet been scratched. This classic upside-down cake is fantastic. A summer cake at its best. With a hint of balsamic, the tart cherries are robust and tangy. Owing to the stiff eggs whites folded in at the last minute, the cake itself is shockingly springy. Overall, sophisticated, timely, and delicious. Cherries and cornmeal are a match made in heaven. p.s. I almost forgot--Supper"! Hard to believe it's been two whole years. As always, thanks for reading. We really appreciate our readers.